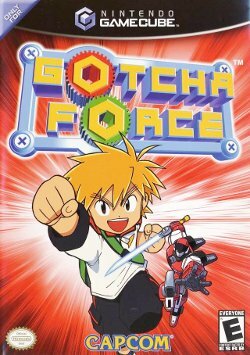 Gotcha Force is a game for the Nintendo GameCube. Poor reviews from professional critics plagued the game, as well as lack of advertising, but many gamers disagree with professional opinion, having given the game high user ratings. Capcom themselves seem to consider the game as one of their favorites, as the official Japanese site is stocked with concept art, screenshots of the developers messing around, and videos. There is (or was) a toy and manga line in Japan, though (like the game) it is exceedingly rare now. The Earth is being attacked by small army of Gotcha Borgs (small toy-like fighters with enough power to level the Earth) called the Death Force. Luckily, a child named Kou finds a borg called G-Red and forms the Gotcha Force. Allied by his friends, Kakeru and Mana, (plus many more) Kou counter-attacks and aims to get rid of the menace, known as the Death Force's leader, the Galactic Emperor. Some have considered the gameplay to be similar to Virtual On, while others believe it to be reminiscent of a 3D Super Smash Bros. It also bears resemblance to Pokémon (with its emphasis upon acquiring more Gotcha Borgs and battling them against each other). The game focuses primarily on its combat system, which goes as follows: Before each match, GF Commanders must pick Gotcha Borgs to put on a force. Each Gotcha Borg, depending upon its powers and abilities, costs a specific amount of "GF Energy" in order to place on a force — in Story Mode, GF Energy increases with each match. In multiplayer, GF Energy is determined by players beforehand. Once Forces are determined, the battle begins. Borgs are placed in an arena, and both Borgs are constantly locked onto each other. If there is more than one enemy, Borgs can switch their lock between enemies, or have the option to lock onto allies (for healing or support). Gamers must quickly dodge, move, use borg abilities, and use the arena to their advantage in order to evade or block incoming attacks. Borgs can have up to five attack capabilities. Once a borg is defeated, that does not mean the match is over. Forces are determined by multiple Gotcha Borgs, and once one is defeated, the next Gotcha Borg in the Force will arrive in the arena, picking up where his or her fallen ally left off. Battles continue until a Force simply has no more Gotcha Borgs. There are many different types of Gotcha Borgs. Some types include wing, demon and machine. Each type acts differently, like wing types can sometimes fly. Some types of Gotcha borgs have the ability to make a partner bigger or make an enemy smaller, some borgs can even change the look and abilities of an opponent — there are many different strategies to use with a single force, counters to these strategies, and counters to these counters. There are over 200 Gotcha Borgs overall. This page was last edited on 18 June 2009, at 09:13.